New data from Chandra and the Very Large Array suggest that black hole growth may precede the growth of bulges in some galaxies. Henize 2-10 is a dwarf starburst galaxy about 30 million light years from Earth with properties similar to those in the early Universe. 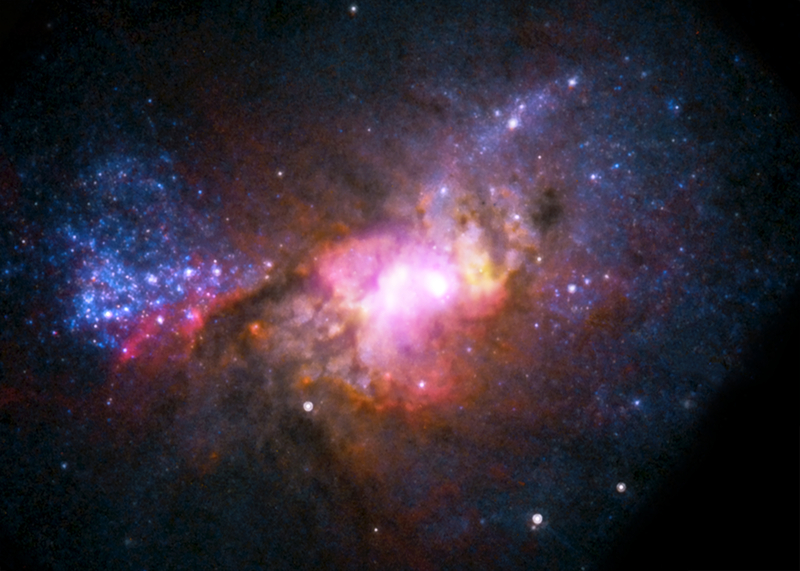 X-ray and radio data indicate a black hole at the center of Henize 2-10 with a mass about one million times that of the Sun. The combined observations from multiple telescopes of Henize 2-10, a dwarf starburst galaxy located about 30 million light years from Earth, has provided astronomers with a detailed new look at how galaxy and black hole formation may have occured in the early Universe. 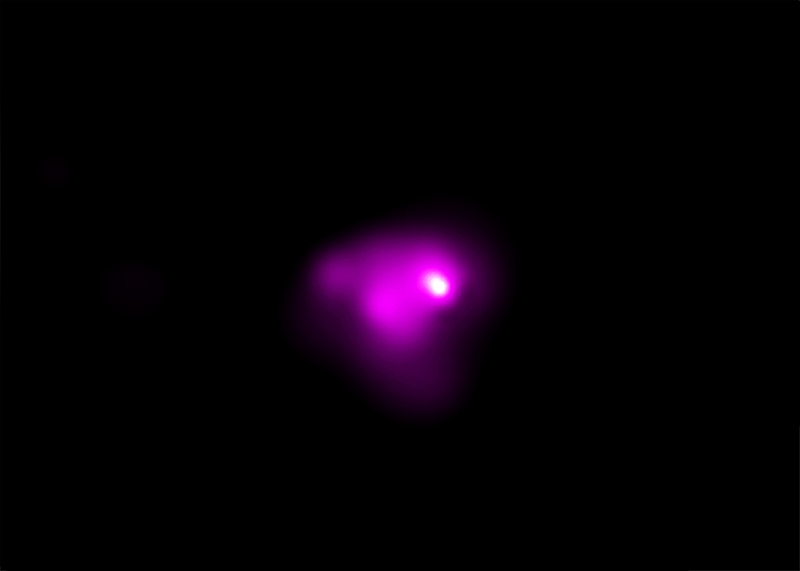 This image shows optical data from the Hubble Space Telescope in red, green and blue, X-ray data from NASA's Chandra X-ray Observatory in purple, and radio data from the National Radio Astronomy Observatory's Very Large Array in yellow. A compact X-ray source at the center of the galaxy coincides with a radio source, giving evidence for an actively growing supermassive black hole with a mass of about one million times that of the Sun (please roll your mouse over the image for the location of the black hole). Coordinates (J2000) RA 08h 36m 15.15s | Dec -26° 24´ 34.00"
Those nuclei that measure in the millions and billions of solar masses are close knitted collections of many black holes. In this case there are one sizable nucleus and several smaller ones. Accounts for the high production of stars and their seemingly random locations. The Plasma Focus interpretation will be vindicated and the Black Hole Theory will be regulated to the dustbin of history. The above data indicate that either the Big Bang model is wrong or the above data received are interpreted wrongly. I prefer the first one. This is very interesting and educational. Seeing a Galaxy forming and coming into being. Something new learned about Black Holes. Stephen Hawking must be mentally leaping up and down. A dwarf starburst galaxy located about 30 million light years from Earth. 30 million light years from Earth. Optical data from the Hubble Space Telescope, X-ray data from Chandra, and radio data from the National Radio Astronomy Observatory's Very Large Array. About 3,600 light years across. X-rays are purple, the radio data are yellow, and the optical data red, green and blue.